View a collection of videos that further describes this research, or read the study's experimental plan. High-grade bone tumors, primarily osteosarcoma (OS) and Ewing sarcoma family tumors (ES), are a significant clinical problem in the pediatric, adolescent and young adult populations. Unlike many other pediatric tumors, there have been few advances in OS treatment protocols since the 1980’s. Although intensification and compression of chemotherapy regimens have led to improved outcomes for patients with localized ES, there has been no similar improvement in survival rates for patients with metastatic disease. Currently, despite aggressive chemotherapy and local control measures, a quarter to a third of patients with localized ES and OS tumors will relapse at distant sites and the overall survival rate for patients who present with metastatic disease, either initially or at relapse, is only 10-20%. Thus, a deeper understanding of the biology of bone sarcoma metastasis is urgently needed so that novel therapies that target and prevent these processes can be developed. Aim 1: Define the molecular mechanisms by which CXCR4 and CD99 promote migration, invasion and metastasis in ES and OS cells and determine if expression of either the receptors or their downstream mediators is associated with tumor progression and patient outcome. Aim 2: Determine if induction of the Rho-MRTF transcriptional axis—downstream of Rho activation—contributes to ES and OS invasion and characterize the respective MRTF-dependent transcriptomes of these aggressive bone sarcomas. Aim 3: Evaluate the potential efficacy of Rho-pathway inhibitors as novel agents to prevent ES and OS invasion and metastasis. The sarcoma metastasis International Collaborative Grant team has been working together for over two years now and includes members from Johns Hopkins University in Baltimore, MD, University of Michigan in Ann Arbor, MI, Children’s Cancer Research Institute in Vienna, Austria, and Rizzoli Orthopedic Institute in Bologna, Italy. The team had face-to-face meetings in Washington, DC (at the AACR meeting in 2013), San Diego, CA (at the AACR Pediatric Cancer at the Crossroads meeting in 2013), and in Berlin, Germany (at the 2014 annual meeting of the Connective Tissue Oncology Society). At the end of the funding period (October 2014), the research program has been able to substantially achieve its goals. Studies based primarily in the Lawlor laboratory revealed that expression of CXCR4 in Ewing sarcoma is extremely heterogeneous in primary tumors. Immunohistochemical staining of large tumor tissue microarrays from the Lawlor and Scotlandi institutional sites (University of Michigan and the Rizzoli Orthopedic Institute) revealed that CXCR4+ cells exist in variable numbers and with different staining intensities within and between tumors. The potential prognostic significance of this heterogeneity is still being ascertained in larger, homogeneously treated patient tumor cohorts, but initial evaluations of these retrospective tumor samples indicate that CXCR4 is not by itself a prognostic biomarker. In order to investigate the mechanistic basis of cell heterogeneity with respect to CXCR4 expression the Lawlor laboratory tested whether alterations in the microenvironment might mediate changes in CXCR4 levels. Indeed, these studies showed that cell stress induces upregulation of CXCR4 expression in Ewing sarcoma tumor cells (Figure 1). Interestingly, they did not detect robust CXCR4 expression in osteosarcoma cells and saw no induction of expression in response to cell stress. Therefore, studies focused on Ewing sarcoma. Stress-dependent induction of CXCR4 resulted in transition of tumor cells from CXCR4- to CXCR4+ states, as determined by cell surface expression of the receptor by FACS analysis (Figure 2). This transition of cells from CXCR4- to CXCR4+ states was associated with a dramatic increase in cell migration and invasion towards CXCL12, the CXCR4 ligand (Figure 3). Furthermore, this increase in motility was mediated by activation of Rac1 rather than RhoA, as has been reported for CXCR4-dependent breast cancer migration. Inhibition of CXCR4 by genetic and pharmacologic means dramatically reduced the migratory and invasive potential of Ewing sarcoma cells towards CXCL12 suggesting that inhibition of this axis may be a novel approach to inhibiting Ewing sarcoma metastasis to lungs and bone marrow in vivo (1). Lungs and bone marrow are frequent sites of Ewing spread and both organs express very high levels of CXCL12, thus serving as chemoattractant sites for tumor recruitment and colonization. We are now collaborating with a medicinal chemist at the University of Michigan to test novel small molecule inhibitors of CXCR4 as potential inhibitors of tumor metastasis in in vivo models. The Scotlandi laboratory performed similar studies of CD99 in osteosarcoma. Although expressed at high levels in Ewing sarcoma, CD99 is expressed at low levels in osteosarcoma, and appears to function as a tumor suppressor. There are two forms of CD99 expressed in osteosarcoma – a full-length form (CD99wt) and a truncated form harboring a deletion in the cytoplasmic domain (CD99sh). 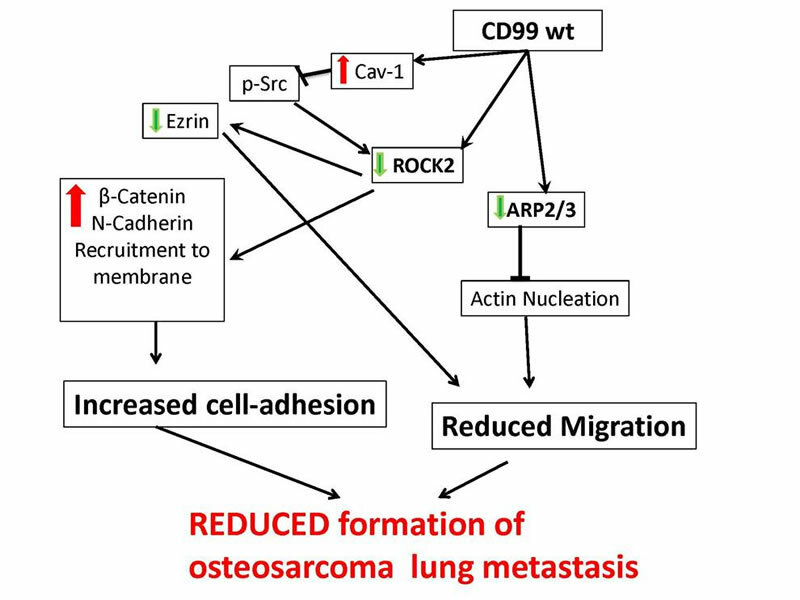 The Scotlandi laboratory found that increasing CD99wt, but not CD99sh, expression in osteosarcoma cell lines leads to recruitment of N-cadherin and β-catenin to adherens junctions and inhibits the expression of a number of genes associated with remodeling of the actin cytoskeleton, including ACTR2, ARPC1A, ROCK2 (Rho-associated coiled-coil containing protein kinase 2), and Ezrin (a cytoskeletal protein strongly associated with metastatic spread of osteosarcoma). Functional studies were performed to determine how CD99wt induces these changes. The results demonstrate that CD99wt maintains an intracellular protein tyrosine kinase, c-Src, in an inactive conformation, and this inhibits ROCK2 signaling, leading to decreased Ezrin at the cell membrane and causing N-cadherin and β-catenin translocation to the plasma membrane (2). 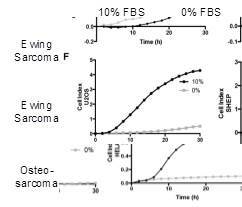 These changes should lead to increased strength of contacts between cells and active stop-migration signals that counteract the otherwise dominant pro-migration action of Ezrin in osteosarcoma cells (Figure 4). These results expand our understanding of the signaling pathways used by cells to transmit information from the cell surface membrane to the cytoskeleton, driving migration and invasion. The identification of targetable enzymes, like CXCR4, Rac1 and ROCK2, may point the way to the development of drugs that interfere with tumor cell mobility, thus preventing metastasis. The downstream transcriptional effectors of Rho and Rac signaling are the myocardin-related transcription factors MRTFA (MKL-1) and MRTFB (MKL-2). This family of transcriptional co-activators is inactive when bound to globular (G-) actin in the cytoplasm, and partly also in the nucleus. Upon signaling from various families of transmembrane receptors, including G-protein coupled receptors, polymerization of G-actin into filamentous (F-) actin depletes G-actin pools, releasing MRTFs, which translocate into the nucleus. Nuclear MRTFs bind to SRF located on CArG sequences in the promoter of various genes and activate their transcription. The transcriptional co-factor family ternary complex factors (TCFs) comprised by ETS family members SAP1, ELK1 and NET, which are activated downstream of Ras signaling, compete with MRTFs for SRF binding in the presence of ETS recognition sites adjacent to the SRF binding sequences in the genome. Consequently, MRTF and TCF binding to SRF are mutually exclusive and activate different subsets of target genes. The Ewing sarcoma oncogenic transcription factor EWS-FLI1 has been previously shown to bind to SRF as a ternary complex factor. Functional consequences of this interaction, however, are unknown. Since SRF serves as a point of convergence in the regulation of processes such as proliferation, migration, adhesion and differentiation, the Kovar group hypothesized that part of EWS-FLI1´s oncogenic and metastasis promoting activity may be due to competition with MRTFs and TCFs for SRF association thereby uncoupling and rewiring SRF transcriptional activity from micro-environmental signaling cues transmitted through G-protein coupled receptors. To test this hypothesis they performed gene expression profiling upon modulation of MRTF and EWS-FLI1 expression in the absence (starved conditions) or presence (serum induced conditions) of serum. Consistent with constitutive nuclear localization of MRTFA, observed by immunofluorescence microscopy, they found that gene regulation by MRTF is already present under starved conditions and did not change much upon serum stimulation. In contrast, MRTFB is cytoplasmic upon serum starved conditions and becomes nuclear either upon serum induction or EWS-FLI1 knockdown, consistent with MRTFB responding to serum induced actin polymerization. Interestingly, only a small set of MRTF target genes were serum inducible, but this set increased dramatically in number and amplitude of induction upon EWS-FLI1 knockdown. The most striking observation, however, was that in the absence of EWS-FLI1, silencing of MRTFs partially rescued the genome-wide EWS-FLI1 transcriptional signature. Together, these results suggest that EWS-FLI1 withdraws target genes from regulation by MRTFs, consistent with our starting hypothesis. Ongoing studies aim at dissecting MRTFA and MRTFB regulated target gene sets and their relation to tumor cell migration and metastasis in Ewing sarcoma. Given the established importance of the MRTF (aka MKL) transcriptional axis in mediating cell motility downstream of Rho-GTPases we also investigated this axis in the context of CXCR4 heterogeneity and cell plasticity in Ewing sarcoma. Investigations based in the Lawlor laboratory focused on studies of cells that were exposed to the stress of serum deprivation and their results uncovered a novel Rac-1-MRTF-depedent cell motility axis that is independent of the well-established MRTF-SRF axis, which is the focus of the complementary work from the Kovar lab. The Lawlor group found that in contrast to other cell types, this novel Rac1-MRTF axis is inhibited by high levels of Rho and is responsible for cell state transitions between non-motile, proliferative and motile, less proliferative states in response to serum deprivation. Importantly, this Rac1-MRTF axis was evident in aggressive neuroblastoma but not in osteosarcoma cells suggesting that this novel mechanism of cancer cell plasticity may be recapitulating the developmental context of primitive neural crest cells. In support of this, directional migration of neural crest stem cells in normal development is dependent on inactivation of Rho with concomitant activation of Rac1. We thus propose that, like epithelial to mesenchymal transitions in carcinoma cells, that aggressive neural crest tumors (e.g. neuroblastoma and Ewing sarcoma) transition back and forth between proliferative and migratory states and that these transitions are modulated by changes in the local microenvironment, in particular the availability of growth factors. Studies to investigate the potential to exploit this axis therapeutically were initiated in collaboration with the Loeb lab. The initial data suggest that inhibition of MRTF proteins in isolation will not block or delay Ewing sarcoma metastasis (studies were performed by the Loeb lab as in Aim 3 using MRTF-inhibitor CCG-1423 as a single agent). Future studies investigation of this axis as a therapeutic target will require combining MRTF inhibition with other agents. Implication of the MRTF axis has already led to in vitro and in vivo testing of inhibitors for the prevention of Ewing sarcoma invasion and metastasis. Although MRTF inhibition blocked activation of Rac1 and cell invasion in vitro, as a single agent the CCG–1423 compound was not able to inhibit metastatic progression in vivo. We are now pursuing the concept of targeting this pathway in a combinatorial approach with other signal inhibitors, or in combination with conventional chemotherapy to target both proliferative and migratory cells simultaneously and thereby improve therapeutic efficacy. Moreover, a more detailed understanding of genes regulated by MTRFA and MTRFB will inform the development of combinatorial approaches in the future. The experiments described above focused on signaling pathways for which specific inhibitors are available, with the goal of introducing Rho pathway inhibitors into clinical practice if, indeed, they show activity in preclinical models. To evaluate the efficacy of these inhibitors to prevent invasion and metastasis, suitable animal models are necessary. Metastasis is a complex, multi-step process, involving tumor growth, invasion of cells into surrounding tissue, migration or cancer cells toward blood vessels, intravasation into the vasculature, survival in the bloodstream, invasion into a distant site, and growth into a metastatic nodule. Most work using animal models to study sarcoma metastasis focus on the tail vein injection model. This model is of limited value for studies like this, however, since cells are introduced directly into the bloodstream, bypassing the initial steps (invasion and migration). To address this issue, the Loeb lab developed a novel animal model of sarcoma metastasis. In this model, fragments of patient-derived xenografts are implanted into the tibia of NOD/SCID/IL-2Rγ knock-out mice. When the tumor reaches sufficient size, the affected limb is amputated, but the mouse is allowed to survive. In a high percentage of such mice, spontaneous distant metastasis is observed. 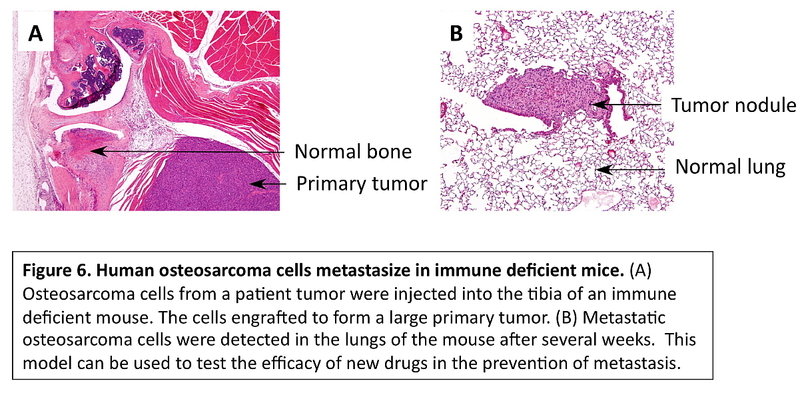 We believe this is a superior model for studying sarcoma metastasis because a) minimally-manipulated patient-derived material is used, rather than cell lines adapted to growth in culture, b) all steps in the metastatic cascade are required for successful metastasis, and c) the development of metastasis after a surgery to control the original tumor more closely mimics the clinical situation faced by sarcoma patients. A manuscript describing this model in more detail has been submitted for publication. This orthotopic implantation/amputation model was used by the Loeb lab to test the ability of a ROCK inhibitor and an inhibitor of MRTF signaling to affect tumor growth and metastasis. Two osteosarcoma xenografts and three Ewing sarcoma xenografts were tested. Unfortunately, neither agent, when given alone, was able to slow primary tumor growth or prolong survival of mice. Although ineffective alone, these agents may still play roles in the treatment of bone sarcomas when given in combination with other signal transduction inhibitors, or when given together with conventional chemotherapy drugs. Future work will explore these possibilities. The most significant outcome was the development of a novel model of sarcoma metastasis. Although this model did not confirm promising in vitro results suggesting a ROCK inhibitor or an inhibitor of MRTF would be an effective treatment for metastatic disease, other work from the Loeb laboratory has identified different agents that appear to have a specific effect on prolonging the lives of mice with metastatic sarcomas. Thus, the new model promises to support ongoing and future work to develop pharmacologic inhibitors of sarcoma metastasis. 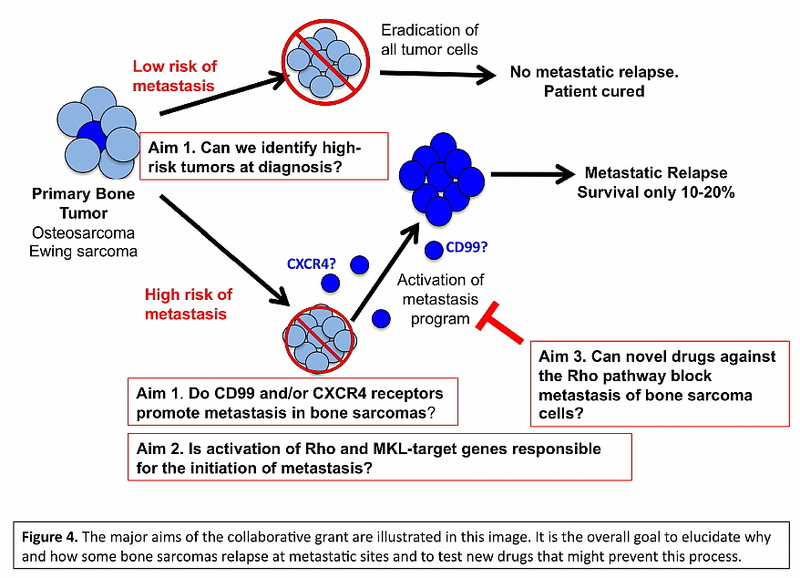 The International Collaborative Grant on Molecular Mechanisms and Pharmacologic Inhibition of Bone Sarcoma Metastasis forged a productive collaboration spanning laboratories in the United States and Europe. We have accomplished the goals of the study, having defined the mechanisms by which CXCR4 and CD99 regulate key cellular processes associated with migration, invasion, and metastasis, identified the MKL/MTRF transcriptome in aggressive bone sarcomas, especially Ewing sarcoma, and generated new in vivo models for studying sarcoma metastasis. This work has resulted in two publications so far, with two more in preparation, as well as numerous abstract presentations at international meetings, and a European collaborative study investigating MTRFA and MTRFB in primary patient samples. In part based on the preliminary results obtained during the Liddy Shriver Sarcoma Initiative International Collaborative Grant funded project period, we have designed a large European collaborative study (ETSoPATH) which was submitted to the European Community for funding under the Horizon2020 program on Oct 14, 2014. In addition, collaborative ties among the member laboratories have been strengthened, and plans are in place to pursue additional funding to advance this work and test hypotheses generated by these experiments. 1. Krook MA, Nicholls LA, Scannell CA, Chugh R, Thomas DG, Lawlor ER. 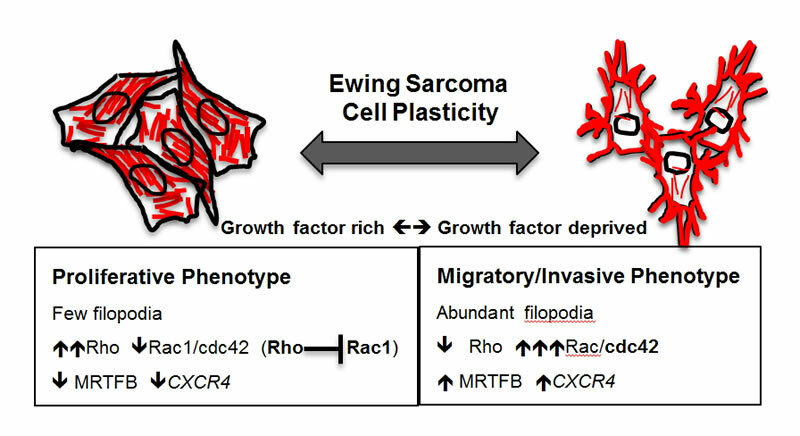 Stress-induced CXCR4 promotes migration and invasion of ewing sarcoma. Molecular Cancer Research 12(6): 953-64, 2014. 2. Zucchini, C, Manara, MC, Pinca, RS, De Sanctis, P, Guerzoni, C, Sciandra, M, Lollini, P-L, Cenacci, G, Picci, P, Valvassori, L, and Scotlandi, K. CD99 suppresses osteosarcoma cell migration through inhibition of ROCK2 activity. Oncogene 33(15): 1912-21, 2014. Manuscripts from the Kovar and Loeb laboratories are in preparation or have been submitted and we anticipate publication during 2015. Copyright © 2015 Liddy Shriver Sarcoma Initiative. 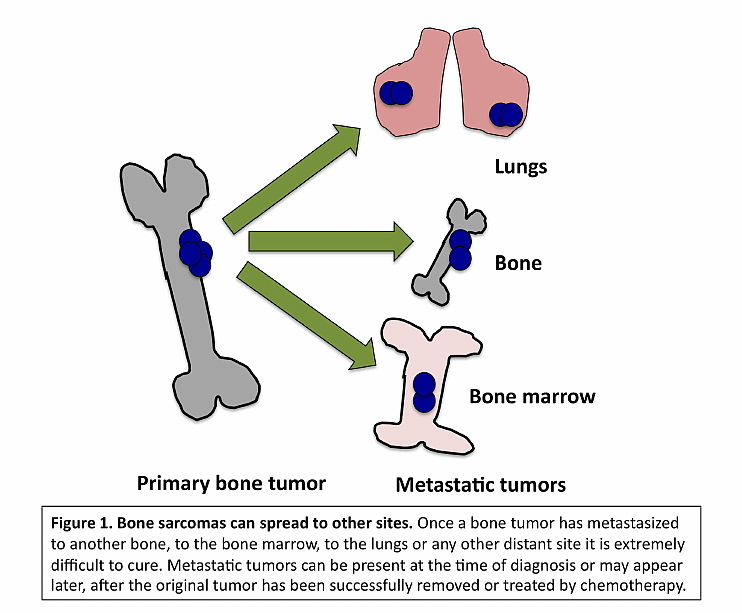 Figure 1: Bone sarcomas can spread to other sites. Aggressive cancers have the ability to spread from their original site to other sites in the body. Bone sarcomas are particularly prone to migrate from the original bone to other bones, the lungs, and the bone marrow. The spread of a local tumor to distant sites is called metastasis. Metastasis remains the leading cause of cancer-related death in patients who are diagnosed with solid cancers, including children and adolescents who are diagnosed with bone tumors. Metastatic disease may be detected at the time of original presentation or may present months or even years later, at the time of disease relapse. Improved outcomes for patients with bone sarcomas depend on the development of novel therapies that can successfully prevent and treat metastasis. 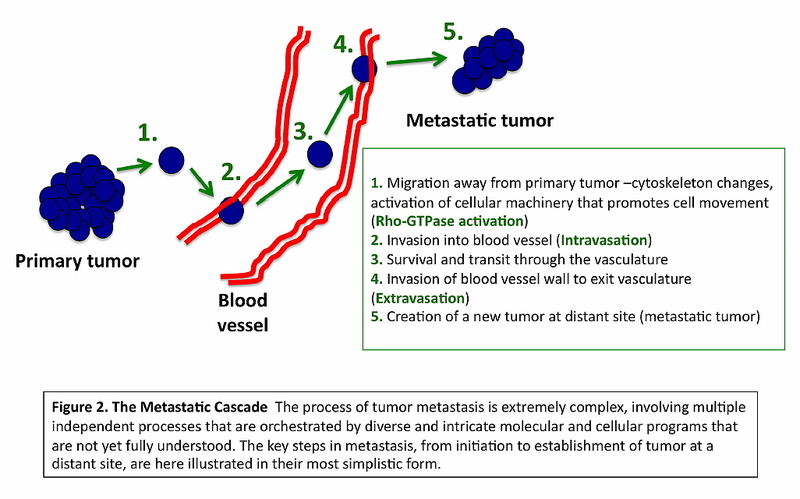 Figure 2: The metastatic cascade. The first step of cell migration is thought to be remodeling of the filamentous actin cytoskeleton, which allows the formation of protrusions that adhere to the extracellular matrix and generate intracellular contractile forces that drive cell movement.2 These events are regulated by extracellular signals and a complex and dynamic network of intracellular mediators, which frequently work in a cell-specific manner. The extracellular signals converge on members of the Rho family of GTPases, and increased expression and activity of Rho GTPases is associated with a metastatic phenotype in a variety of tumor types.3 RhoA, in particular, plays a pivotal role in tumor cell invasion and metastasis by regulating actin polymerization at the leading edge of migrating cells.4 The specific upstream signals modulating RhoA expression and activity are both cell type- and context-specific. Preliminary data from the Lawlor and Scotlandi labs (see below) together suggest that CXCR4 and CD99 may modulate Rho signaling in bone sarcomas. Interfering with elements that govern these mechanisms and control cell migration will diminish the capacity of bone sarcoma cells to manifest an invasive phenotype, thus reducing invasion and metastasis. This proposal will leverage the unique expertise and collaborative potential of four independent and international laboratories with established track records in the field of bone sarcoma research. The four principal investigators, Drs. 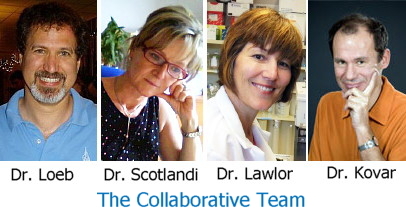 Elizabeth Lawlor (University of Michigan), David Loeb (Johns Hopkins University), Heinrich Kovar (Children’s Cancer Research Institute, Wien, Austria), and Katia Scotlandi (Rizzoli Orthopaedic Institute, Bologna, Italy), have together published widely in the areas of ES and OS and have previously co-authored several manuscripts, demonstrating an already strong commitment to collaboration. Dr. Kovar has a particular strength in bioinformatics, Drs. Lawlor and Scotlandi have extensive experience dissecting and inhibiting signaling pathways in ES, and Dr. Loeb has a panel of primary patient ES and OS xenografts, as well as a history of successfully translating preclinical work into early phase clinical trials in both OS and other sarcomas. Thus, the successful completion of the proposed research will benefit from the strengths each research group brings to the collaboration. 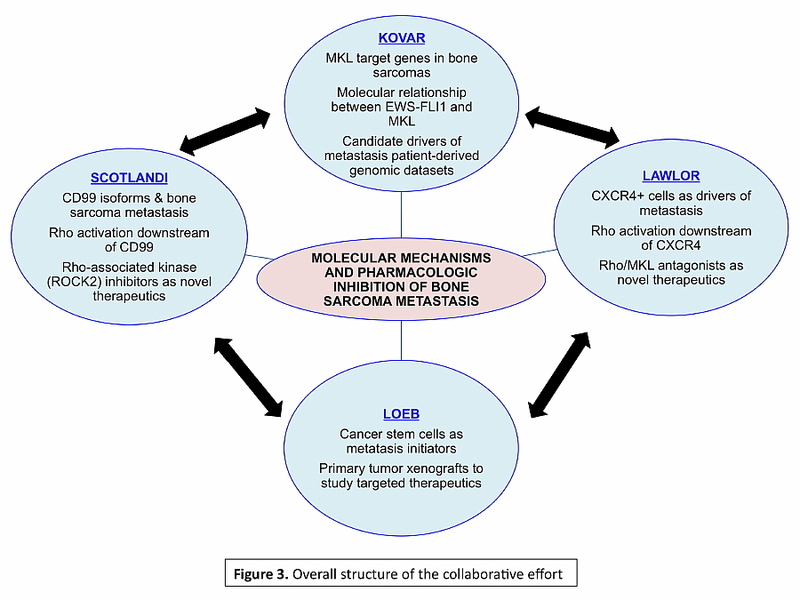 Additionally, the involvement of investigators with leadership roles in the European (Kovar – EuroEwing; Scotlandi – EuroSarc) and North American (Lawlor – Children’s Oncology Group) cooperative clinical trials networks provides a strategic opportunity to rapidly communicate seminal findings to the clinical research community. Figure 3: Overall structure of the collaborative effort. To optimize the success of this collaborative venture, the investigators have developed a structure that will allow each laboratory to exploit its own areas of expertise whilst benefitting from the intellectual and technical contributions of the other laboratories. In addition, the structure allows us to focus, when appropriate, on either ES or OS in isolation, and when supported by scientific rationale, to study ES and OS together. As illustrated, each aim of the research proposal will involve the expertise of multiple laboratories, ensuring a true collaborative effort that will require all four investigators to contribute to the success of the project as a whole. Figure 4: Aims of the collaborative research program. It is our overall hypothesis that an improved understanding of the biology that drives bone sarcoma cell migration and invasion will lead to the development of novel targeted therapies that can inhibit and prevent metastatic relapse and progression. Published and unpublished data from our own labs and others support the hypothesis that the cell surface receptors CXCR4 and CD99 contribute to ES and OS metastasis. Importantly, substantial evidence in other tumor types links CXCR4 to activation of RhoA and RhoC, closely related small GTPases that mediate cytoskeletal and transcriptional changes that confer migratory and invasive potential to tumor cells. The Rho signaling pathway is a frequently mentioned potential therapeutic target in a variety of malignancies,5 and ROCK inhibitors have shown preclinical efficacy in decreasing pulmonary metastasis of B16 murine melanoma6 and bone metastasis in a breast cancer model system.7 We thus hypothesize that Rho is a common point of convergence of at least two independent metastasis-promoting pathways and that targeting Rho and its effectors will effectively inhibit ES and OS cell migration, invasion and metastasis. Aim 2: Determine if induction of the Rho-MKL transcriptional axis—downstream of Rho activation—contributes to ES and OS invasion and characterize the respective MKL-dependent transcriptomes of these aggressive bone sarcomas. In this proposal we will use both human tumor specimens as well as cell models in the laboratory to elucidate how bone sarcomas initiate the metastatic process. Evidence from the investigators’ labs as well as many other cancer researchers in the field has shown that activation of a protein called Rho may be an essential early step in the spread of sarcoma cells. The contribution of Rho to bone sarcoma movement and spread will be investigated and novel drugs that have been developed to specifically block the effects of Rho will be tested in the lab. If these experiments are successful then future studies will aim to move these new drugs into the clinical setting to try to prevent relapse in patients with high-risk disease. Define the molecular mechanisms by which CXCR4 (Aim 1.1) and CD99 (Aim 1.2) promote migration, invasion and metastasis in ES and OS cells and determine if expression of either the receptors or their downstream mediators is associated with tumor progression and patient outcome (Aim 1.3). Not all cells in a tumor have the ability to spread to other sites. In bone sarcomas there is accumulating evidence that cells that express high levels of a protein called CXCR4 have a greater potential to metastasize than cells that express low levels of this protein. Identification and selective elimination of cells that have the potential to metastasize should prevent relapse of the tumor at distant sites and improve patient survival. Although much is known about the contribution of CXCR4+ cells to metastasis, the signaling pathways downstream of CXCR4 that mediate the metastasic phenotype remain to be fully elucidated. Recent studies in epithelial tumors have demonstrated that CXCR4 induces Rho activity.17-19 Rho-GTPases are well-established mediators of cancer cell migration, invasion and metastasis and are activated downstream of a diverse array of cell surface receptors and intracellular signaling molecules.9 Preliminary data from the Lawlor and Scotlandi labs demonstrate that Rho is active in ES and OS cells, leading us to hypothesize that Rho is a key player in mediating metastasis of bone sarcoma cells. We will sort ES and OS cell lines (TC71, A673, SAOS2, U2OS) by FACS into CXCR4-high and CXCR4-low populations (populations enriched for and depleted of stem-like cells, respectively) and assess the migration and invasion capacity of each population in vitro. RhoA and RhoC expression and activity will be assessed and compared in the sorted populations. Migration and invasion of CXCR4-high and CXCR4-low cell populations will be assessed in real time in the presence (invasion) or absence (migration) of Matrigel. Serum and SDF-1 (CXCL12) will be used as chemo-attractants to distinguish CXCR4-specific and non-specific effects. 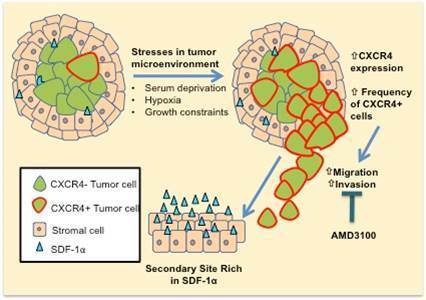 The CXCR4 small molecule inhibitor AMD310010 will be added to media to determine if and to what extent CXCR4 inhibition abrogates the migratory/invasive phenotype. To confirm the mechanistic contribution of CXCR4 to the migratory phenotype we will repeat these studies with unsorted cells that have been genetically modified to express higher (over-expression cDNA constructs) or lower (shRNA knockdown constructs) levels of CXCR4. Rho expression and activity will be assessed in the different conditions to determine if Rho is activated downstream of CXCR4 in ES and/or OS cells. To assess the potential for cellular invasion and metastasis in a more physiologic environment we will make use of an innovative ex vivo assay of pulmonary metastasis that allows for real-time visualization of metastasis formation within explanted lung cultures from immune deficient mice.20 We will assess the potential of CXCR4-high and CXCR4-low ES cells to form colonies in this ex vivo model. Putative ES cancer stem cells have been identified in both the Loeb and Lawlor labs using ALDH1 activity21 and label-retention assays (unpublished data). In other tumor types, cancer stem cells have been shown to be initiators of metastasis.22 We will evaluate CXCR4 and Rho activity in the ALDH-high (stem cell-enriched) and ALDH-low (stem cell-depleted) as well as in the PKH26 label-retaining (stem cell-enriched) and non label-retaining (stem cell-depleted) populations. We will determine the functional consequences of CXCR4 expression and activation in cancer stem cell populations by evaluating migration and invasion as described above in the presence or absence of recombinant CXCL12 or AMD3100. CD99 is a transmembrane protein encoded by the MIC2 gene that encodes two distinct products due to alternative mRNA splicing: a long form (32-kDa), corresponding to the full-length protein (CD99wt) and a short form harboring a deletion in the intracytoplasmic domain (CD99sh).23 The function of CD99 is dependent on cell type and isoforms. Thus, expression of CD99 in ES and some other tumors is high and associated with tumor progression,24-28 while in other tumors, such as OS, CD99 is expressed at low levels and functions as a tumor suppressor.29,30 CD99sh expression increases MMP9 activity31 and stimulates the migration, invasion and metastasis of breast cancer31 and OS 30 cells. 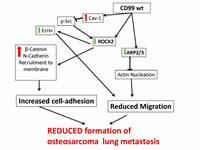 In contrast, CD99wt significantly inhibits anchorage-independent cell growth, cell migration, and metastasis in OS.29 Importantly, mutation of Ser168, but not Tyr146, increased the migration and anchorage-independent growth of OS cells, clearly demonstrating an important role of CD99 in the invasive phenotype of OS.30 Thus, elucidation of the signaling pathways engaged by CD99 in ES and OS cells, and the differences between the isoforms, will yield valuable information regarding mechanisms of ES and OS metastasis. The cell surface protein CD99 is expressed by both Ewing sarcoma and osteosarcoma cells. However, the function of this protein is unknown, and preliminary studies suggest that CD99 may play a different role in the two different bone sarcomas. The reason for this different function could be related to the fact that the protein can exist in two distinct forms. The studies in this proposal will evaluate the contribution of these different forms of CD99 to the growth and invasive potential of Ewing sarcoma and osteosarcoma to better understand the function of this enigmatic protein in promoting or inhibiting bone sarcoma metastasis. We will investigate if there is an association between CD99 expression and Rho activity. A panel of ES and OS cell lines with variable levels of CD99 expression will be assessed for RhoA activity. To demonstrate a causal relationship between CD99 and RhoA, we will modulate CD99 expression (increasing expression by transfecting CD99-negative cell lines with a CD99 expression vector and decreasing expression in CD99-positive lines using shRNA) and determine the effect on RhoA activity. In addition, using experimental models already developed in the Scotlandi lab (OS cells expressing CD99wt, CD99sh, CD99mutY146, CD99mutS168, CD99wt plus CD99sh at different ratios), differential effects on RhoA signaling will be assessed. Next, we will investigate the role of known downstream cytoplasmic effectors of activated Rho in promoting CD99-mediated migration and invasion. Cell motility is dependent on actin stress fiber formation, which is regulated by Rho-associated kinases (ROCKs) and by lamellipodial actin assembly and protrusion, which are mediated by the actin-related protein (Arp2/3) complex.32 We will use the specific ROCK2 inhibitor, N-(2-(2-(dimethylamino)ethoxy)-4-(1H-pyrazol-4-yl)phenyl)-2,3 dihydrobenzo[b][1,4]dioxine-2-carboxamide, and ROCK2 siRNA to verify a functional connection between ROCK2 expression/activity, cytoskeletal rearrangement, ezrin expression and OS migration and invasion in vitro. Once we have clarified the relationships among CD99, ROCK2, and migration/invasion in OS cells, comparable experiments will be performed in ES cells, wherein abrogation of CD99 expression has been shown to inhibit migration and invasion. Finally, because CD99 is expressed on normal mesenchymal stem cells, we will investigate the role of CD99 in ES stem cell function. As an initial step, we will generate CD99-negative ES cell lines using shRNA and use FACS to determine whether loss of CD99 expression affects stem cell number, based on ALDH expression. We will also isolate ES stem cells, based on both ALDH expression and PKH26 label retention, from wild-type and CD99-silenced ES cell lines and compare stem cell function based on in vitro assays. Figure 5. 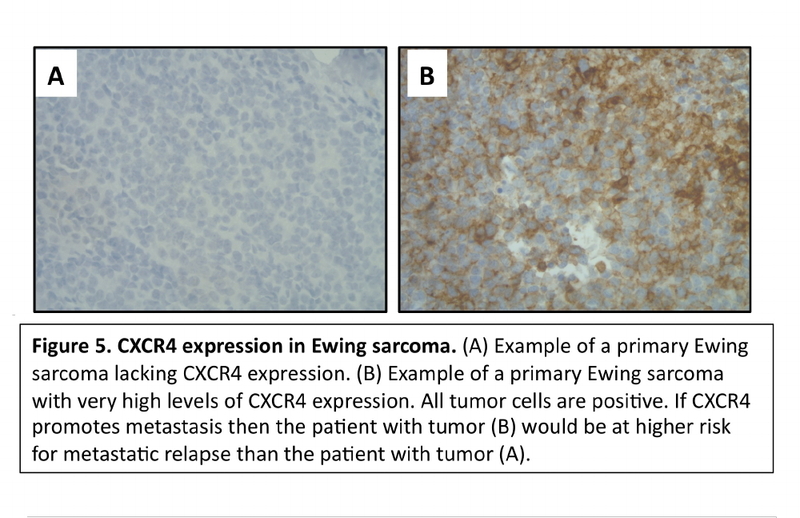 Differential levels of CXCR4 in Ewing sarcomas. Although the presence of metastatic disease at diagnosis is uniformly a poor prognostic sign, there are currently no other clinical or pathologic criteria that can reliably predict relapse risk in patients diagnosed with bone sarcomas. Given that the primary cause of disease-related death in ES and OS patients is metastatic relapse, there is a great need to identify high-risk patients in order that they can be selected for inclusion in trials designed to test promising new therapies. To maximize the clinical significance of our studies we will assess the expression and prognostic value of the identified metastasis genes and pathways in clinically annotated patient samples. Affymetrix HuEx gene expression profile data from over 100 clinically annotated ES tumors from European (Euro-Ewing) and North American (COG) cooperative trials are immediately accessible to the investigators on this proposal. Once published, these datasets will also be widely available to the greater sarcoma research community. In addition, OS and ES tissue microarrays (TMAs) that have been created from clinically annotated tumor samples are available for study at both The Rizzoli Institute (collected between 1996 and 2006) and the University of Michigan (collected between 1999 and 2009). Markers that are implicated as mediators of metastasis in our experimental models and also found to be associated with aggressive clinical disease will be deemed most significant and will be prioritized for the development and testing of targeted therapeutic approaches. Physicians are currently unable to predict which patients with localized tumors are at risk for tumor relapse either locally or at distant sites. This is because there are no known tests that can yet be done on the tumor or the blood that can identify high-risk disease. If we could identify patients who are at risk for metastasis at the time of initial diagnosis or early in their treatment course we could alter their therapy to include new, metastasis-preventing therapies such as those that we will test in this collaboration. Determine if induction of the Rho-MKL transcriptional axis—downstream of Rho activation—contributes to ES and OS invasion (Aim 2.1) and characterize the respective MKL-dependent transcriptomes of these aggressive bone sarcomas (Aim 2.2). RhoA/C promote invasion directly by affecting cytoskeletal changes in the cytoplasm and indirectly by activating a downstream transcriptional cascade. Rho-dependent transcription is mediated by the transcriptional co-activators MKL1 and MKL2 (also known as MRTFA and MRTFB) that translocate to the nucleus upon RhoA/C activation. MKL cytoplasmic/nuclear shuttling is regulated by monomeric G-actin, which binds to MKL in the cytoplasm supporting cytoplasmic sequestration and inhibiting transcriptional MKL activity. Upon Rho activation, actin assembly and stress fiber (F-actin) formation occurs thus depleting G-actin and releasing MKL for nuclear translocation. Once in the nucleus, MKL proteins cooperate with serum response factor (SRF) to activate a subset of SRF-response genes.33-35 Significantly, the Rho/MKL/SRF transcriptional axis was recently shown to be required for invasion and metastasis of breast cancer and melanoma cells.35 However, the precise identity of Rho/MKL transcriptional targets is in large part dependent on cell type and, therefore, the mediators of MKL-driven metastasis are likely to differ in different tumor types. ES and OS are both highly metastatic bone tumors but are driven by distinct pathogenetic mechanisms. The biology of ES is largely determined by the expression of a chimeric ETS transcription factor, EWS-FLI1, while the pathogenic forces in OS are largely undetermined and likely very heterogeneous. Early studies suggested that EWS-FLI1 can serve as a ternary complex factor (TCF) for SRF on serum response element (SRE)-containing promoters.36,37 Similar to TCFs ELK1 and SAP1A, EWS-FLI1 uses the FLI1 encoded B-box to interact with SRF. MKL1 also contains a B-box and competes with ELK1 for SRF binding.38 Consequently, it is possible that EWS-FLI1 functionally interferes with MKL/SRF activity by competitive binding. The Kovar lab therefore interrogated a list of 26 previously published MKL target genes39 for binding of EWS-FLI1, as monitored by FLI1 ChIP-seq, (Bilke et al., submitted), and for dependence on EWS-FLI1 expression, as monitored by gene expression profiling in response to RNAi mediated EWS-FLI1 modulation.40 These genes had been defined as putative MKL targets based on their sensitivity to dominant negative MKL1 after serum induction.39 Results of these studies strongly suggest that many typical MKL target genes are regulated by EWS-FLI1 in ES. Amsellem et al. 41 reported that the actin cytoskeleton is completely disrupted in ES, retaining very few stress fibers, focal adhesions and cell-to-cell contacts. Also, Delaroche et al42 reported that EWS-FLI1 transformed NIH3T3 have a deranged actin cytoskeleton. Consequently, one has to assume a high fraction of monomeric G-actin potentially sequestering MKL and interfering with its transcriptional activity in line with low levels of zyxin in ES, a major regulator of actin polymerization and a transcriptional MKL and EWS-FLI1 target. Knockdown of EWS-FLI1 is expected to increase actin polymerization and consequently support nuclear MKL activity. Preliminary data from the Lawlor lab show that in low serum conditions MKL is constitutively localized to ES cell nuclei and that pharmacologic inhibition of the Rho/MKL axis leads to nuclear exclusion and inhibition of ES cell migration. The question, therefore, arises if MKL is similarly active in ES and OS and subject to regulation by RhoA/C signaling, or if EWS-FLI1 uncouples RhoA/C signaling from MKL target gene regulation. We will use genetic studies to define the contribution of MKL-driven transcription to ES and OS migration and invasion and define MKL target genes in these two bone sarcomas. For cells to successfully migrate away from the original tumor they must first activate a set of genes that control and direct cell movement. The genes that are activated to direct cell migration are numerous but are different in different cancers. Currently the identity of these genes is not known in bone sarcomas. In these studies we will evaluate a set of genes that have been shown to be important for cell movement and metastasis in breast cancer, prostate cancer and malignant melanoma to determine if they are also responsible for initiation of metastasis in bone sarcomas. Expression of MKL1 and MKL2, alone or together, will be inhibited in ES and OS cell lines using lentiviral constructs engineered to deliver validated shRNA sequences targeting MKL1 and MKL2 or a non-targeting control sequence.35,43 The ability of genetically modified bone sarcoma cells to migrate and invade will be assessed and compared in control and knockdown cells. In addition to migration and invasion assays, we will also assess the ability of MKL over-expressing and knockdown cells to form colonies in soft agar. Interestingly, prior studies of MKL modulation showed that knockdown of MKL had no effect on the primary tumorigenicity of breast cancer and melanoma cells as evidenced by equivalent colony formation in soft agar and subcutaneous tumor formation in immune deficient mice.35 Rather, the phenotypic consequences of loss of MKL function were apparent only when invasion and metastasis were evaluated.35 Thus, we anticipate that modulation of MKL may have profound effects on invasion but little effect on in vitro clonogenic potential. Demonstration that MKL is important for bone sarcoma invasion will validate our hypothesis that targeting of this pathway could be effective at preventing metastatic relapse. The transcriptional targets of MKL/SRF are in part cell type dependent. Therefore, to fully elucidate how MKL contributes to bone sarcoma invasion, it will be important to define and compare the genetic consequences of MKL modulation in ES and OS cells. For the investigation of OS, we will use the genetically modified cell lines generated in Aim 2.1. For ES, Asp14 (A673 ES cell line with doxycycline inducible EWS-FLI1 shRNA)44 will be transduced with MKL knockdown or control constructs. Additionally, we will apply a previously published dominant negative MKL construct (DN-MKL) that competes for MKL binding to SRF.45 Pan-genomic gene expression changes will be assayed by expression profiling of two biological replicates per experiment using Affymetrix Human Exon 1.0 ST arrays. These experiments will reveal MKL1 and MKL2 signatures in the presence and absence of EWS-FLI1 and thus not only identify putative ES and OS specific MKL targets but also reveal the influence of EWS-FLI1 on the MKL signature of ES. Subsequently, we will compare gene expression profiles of pairs of cell lines isolated from primary tumors and corresponding metastatic lesions isolated in our labs as previously described by us.16,46 MKL signature genes as defined above and differentially expressed between primary and metastasis derived tumor cell lines will be mined for candidate metastasis driving genes based on literature information. Evaluate the potential efficacy of Rho-pathway inhibitors as novel agents to prevent ES and OS invasion and metastasis. There is already abundant evidence that dysregulation of Rho-signaling is a prime mediator of metastasis in human cancers,3 and several compounds targeting different aspects of the Rho signaling axis are already in early and later stages of development and testing.5 Our preliminary data suggest that Rho-signaling is also of relevance to bone sarcomas. Therefore, we will perform in vitro and in vivo studies of Rho pathway-targeted agents to determine if any of these agents inhibit OS or ES invasion and metastasis. Successful outcomes with these critical preclinical studies will provide a strong rationale for moving these agents rapidly into early phase clinical trials for high risk patients. The Scotlandi lab has been exploring the use of a specific ROCK2 inhibitor, N-(2-(2-(dimethylamino)ethoxy)-4-(1H-pyrazol-4-yl)phenyl)-2,3 dihydrobenzo[b][1,4]dioxine-2-carboxamide. Both OS and ES cells will be treated in vitro with the ROCK2 inhibitor and tested for evidence of inhibition of in vitro correlates of metastasis: migration, invasion, and adhesion to different matrix components. Effects of the inhibitor on growth in anchorage independent conditions, either in soft agar or in nonadherent tissue culture plates, will also be analyzed. Effects on cell proliferation and apoptosis will be evaluated by MTT assays and FACS evaluation of Annexin V-positive cells. Figure 6. Human osteosarcoma cells metastasize in immune deficient mice. To measure the effect of ROCK2 inhibition on metastasis in more physiologically relevant conditions, in vivo studies will be performed using xenograft models. The Loeb laboratory has acquired a panel of primary ES and OS xenografts – tumors derived directly from samples obtained from patients treated at the Pediatric Oncology Branch of the NIH – that grow readily in NOD/SCID/IL-2Rγ null (NOG/SCID) mice. These primary, patient-derived xenografts (2 OS, and 4 ES, confirmed to express EWS-FLI1 by PCR) are much more closely related to patient tumors than are xenografts created from established, in vitro passaged cell lines. Importantly, the primary OS xenografts metastasize to lungs following orthotopic implantation in the pretibial region of mice, and they will, therefore, serve as the optimal physiologic model with which to study the effects of compound on tumor metastasis. After establishing a maximal tolerated dose of the ROCK inhibitor, mice will be treated in cohorts of 5. One cohort, treated with vehicle alone, will serve as controls. For OS xenografts, tumor will be implanted in the pretibial space. Mice will begin treatment after recovery from surgery: one cohort implanted with each xenograft will be treated immediately, while a second cohort is treated once the tumors have reached a diameter of 0.5 cm. Finally, mice bearing the OS xenografts will be allowed to remain untreated until tumors reach a diameter of 2 cm. Survival surgery will be performed, removing the tumor without killing the mouse. One such cohort will be treated with the ROCK2 inhibitor, while a control cohort is treated with vehicle alone. This group of mice will allow an assessment of the ability of the ROCK2 inhibitor to interfere with the growth of micrometastatic pulmonary nodules. We have not yet tested the ability of orthotopically implanted ES xenografts to generate pulmonary micrometastases. We will implant each of the ES xenografts in the pretibial space, sacrifice the mice when tumors reach an appropriate size, and evaluate the lungs for the presence of micrometastatic disease. If nodules are found, this model system will be used for further testing. If not, single cell suspensions will be made, and tail vein injections performed. For each ES xenograft, mice will be treated in cohorts of 5. One cohort, treated with vehicle alone, will serve as controls. One cohort will either have tumor implanted in the pretibial space or undergo tail vein injection of a single cell suspension generated from freshly harvested xenograft grown in donor mice. Another cohort of mice will be implanted with 1,000 ES stem cells derived from each ES xenograft and then treated with the ROCK2 inhibitor upon recovery from the implantation procedure. Vehicle-treated mice implanted with the same number of stem cells will serve as controls. Taken together, this work will determine the effect of ROCK2 inhibition on the growth of xenografts in vivo, as well as effects on ES stem cell function and both ES and OS micrometastatic pulmonary disease. These preclinical studies will help guide the rational development of early phase clinical trials in patients with ES and/or OS at high risk of metastatic relapse. A novel class of compounds that selectively inhibit Rho/MKL transcriptional activity has recently been described (CCG-1423 and analogues).34,47 Preliminary studies with these compounds have demonstrated that they inhibit ES migration and growth in vitro. These data lead us to propose that the Rho/MKL axis is a promising new therapeutic target, and that inhibition of Rho/MKL transcriptional signaling will prevent metastasis of ES cells. In this aim we will test the efficacy of CCG-1423 and derivative compounds as inhibitors of ES cell growth and invasion in vitro, ex vivo and in vivo. For in vitro studies we will expand our preliminary studies to include 4 different ES cell lines (TC71, A673, CHLA9 and CHLA10). CHLA9 and CHLA10 are isogenic cell lines, established from primary and metastatic lesions from the same patient before and after chemotherapy, respectively. We will perform in vitro assays of cell migration and invasion following exposure to increasing doses of compound. We will assess MKL nuclear localization and expression of established downstream transcriptional targets of MKL/SRF in drug-exposed cells to confirm that the compounds are hitting the expected target. Viable cells that have been exposed to drug for 3 days in vitro will be plated in soft agar to determine if exposure to Rho/MKL inhibitors alters their clonogenic potential in anchorage-independent conditions. In addition, we will test the ability of these compounds to interfere with the growth and metastasis of ES xenografts in ex vivo and in vivo assays. The ability of ES cell lines to establish metastatic foci in the presence or absence of Rho/MKL inhibitorsin ex vivo lung explants will be compared. The ability of drug-treated cells to form metastases in vivo will be determined by monitoring tumor formation in NOG/SCID mice that have received tail vein injections of luciferase-labeled ES cells. Finally, we will determine if treating mice with Rho/MKL inhibitors will prevent tumor metastasis and/or cause tumor regression in mice with established tumors. There is a desperate need for new drugs that can treat and prevent metastatic bone sarcoma. Several new compounds are available that were designed to specifically block the Rho pathway. These agents have shown promising early results in laboratory studies of both Ewing sarcoma and osteosarcoma cells. These compounds will now be rigorously tested to determine if any/all of them could be useful as additional therapy for patients with bone sarcoma. The ultimate goal of these therapies will be to target mobilized cancer cells so that they are killed before they can form a metastatic tumor at a distant site. The group held their initial meeting in Polonia Castle in Pultusk, Poland, in October 2012 in conjunction with the ESF-EMBO Symposium "Molecular Biology and Innovative Therapies in Sarcomas of Childhood and Adolescence." Annual meetings are planned in conjunction with the meeting of the Connective Tissue Oncology Society, and virtual meetings will be held using Skype. This project represents the initiation of a planned multilateral study of bone sarcoma metastasis among the investigators. We will leverage the results and publications resulting from the current program to obtain ongoing competitive grant funding to follow up promising data beyond the current project. Future work will comprise both laboratory investigation as well as the development of early phase clinical trials. 1. Yilmaz, M. & Christofori, G. Mechanisms of motility in metastasizing cells. Mol Cancer Res 8, 629-42 (2010). 2. Mattila, P. K. & Lappalainen, P. Filopodia: molecular architecture and cellular functions. Nat Rev Mol Cell Biol 9, 446-54 (2008). 3. Narumiya, S., Tanji, M. & Ishizaki, T. Rho signaling, ROCK and mDia1, in transformation, metastasis and invasion. Cancer Metastasis Rev 28, 65-76 (2009). 4. Struckhoff, A. P., Rana, M. K. & Worthylake, R. A. RhoA can lead the way in tumor cell invasion and metastasis. Front Biosci 16, 1915-26 (2011). 5. Lu, Q., Longo, F. M., Zhou, H., Massa, S. M. & Chen, Y. H. Signaling through Rho GTPase pathway as viable drug target. Curr Med Chem 16, 1355-65 (2009). 6. Nakajima, M. et al. Effect of Wf-536, a novel ROCK inhibitor, against metastasis of B16 melanoma. Cancer Chemother Pharmacol 52, 319-24 (2003). 7. Liu, S., Goldstein, R. H., Scepansky, E. M. & Rosenblatt, M. Inhibition of rho-associated kinase signaling prevents breast cancer metastasis to human bone. Cancer Res 69, 8742-51 (2009). 8. Ben-Baruch, A. Site-specific metastasis formation: chemokines as regulators of tumor cell adhesion, motility and invasion. Cell Adh Migr 3, 328-33 (2009). 9. Dorsam, R. T. & Gutkind, J. S. G-protein-coupled receptors and cancer. Nat Rev Cancer 7, 79-94 (2007). 10. Gassmann, P. et al. CXCR4 regulates the early extravasation of metastatic tumor cells in vivo. Neoplasia 11, 651-61 (2009). 11. Adhikari, A. S. et al. CD117 and Stro-1 identify osteosarcoma tumor-initiating cells associated with metastasis and drug resistance. Cancer Res 70, 4602-12 (2010). 12. Kim, R. H., Li, B. D. & Chu, Q. D. The role of chemokine receptor CXCR4 in the biologic behavior of human soft tissue sarcoma. Sarcoma 2011, 593708 (2011). 13. Kim, S. Y. et al. Inhibition of the CXCR4/CXCL12 chemokine pathway reduces the development of murine pulmonary metastases. Clin Exp Metastasis 25, 201-11 (2008). 14. Laverdiere, C. et al. Messenger RNA expression levels of CXCR4 correlate with metastatic behavior and outcome in patients with osteosarcoma. Clin Cancer Res 11, 2561-7 (2005). 15. Sun, X., Wei, L., Chen, Q. & Terek, R. M. CXCR4/SDF1 mediate hypoxia induced chondrosarcoma cell invasion through ERK signaling and increased MMP1 expression. Mol Cancer 9, 17 (2010). 16. Bennani-Baiti, I. M. et al. Intercohort gene expression co-analysis reveals chemokine receptors as prognostic indicators in Ewing's sarcoma. Clin Cancer Res 16, 3769-78 (2010). 17. Tan, W., Martin, D. & Gutkind, J. S. The Galpha13-Rho signaling axis is required for SDF-1-induced migration through CXCR4. J Biol Chem 281, 39542-9 (2006). 18. Yagi, H. et al. A synthetic biology approach reveals a CXCR4-G13-Rho signaling axis driving transendothelial migration of metastatic breast cancer cells. Sci Signal 4, ra60 (2011). 19. Zheng, R. et al. Neuropeptide-stimulated cell migration in prostate cancer cells is mediated by RhoA kinase signaling and inhibited by neutral endopeptidase. Oncogene 25, 5942-52 (2006). 20. Mendoza, A. et al. Modeling metastasis biology and therapy in real time in the mouse lung. J Clin Invest 120, 2979-88 (2010). 21. Awad, O. et al. High ALDH activity identifies chemotherapy-resistant Ewing's sarcoma stem cells that retain sensitivity to EWS-FLI1 inhibition. PLoS One 5, e13943 (2010). 22. Velasco-Velazquez, M. A., Popov, V. M., Lisanti, M. P. & Pestell, R. G. The role of breast cancer stem cells in metastasis and therapeutic implications. Am J Pathol 179, 2-11 (2011). 23. Hahn, J. H. et al. CD99 (MIC2) regulates the LFA-1/ICAM-1-mediated adhesion of lymphocytes, and its gene encodes both positive and negative regulators of cellular adhesion. J Immunol 159, 2250-8 (1997). 24. Ambros, I. M. et al. MIC2 is a specific marker for Ewing's sarcoma and peripheral primitive neuroectodermal tumors. Evidence for a common histogenesis of Ewing's sarcoma and peripheral primitive neuroectodermal tumors from MIC2 expression and specific chromosome aberration. Cancer 67, 1886-93 (1991). 25. Brown, R. E. & Boyle, J. L. Mesenchymal chondrosarcoma: molecular characterization by a proteomic approach, with morphogenic and therapeutic implications. Ann Clin Lab Sci 33, 131-41 (2003). 26. Dworzak, M. N. et al. CD99 expression in T-lineage ALL: implications for flow cytometric detection of minimal residual disease. Leukemia 18, 703-8 (2004). 27. Kovar, H. et al. Overexpression of the pseudoautosomal gene MIC2 in Ewing's sarcoma and peripheral primitive neuroectodermal tumor. Oncogene 5, 1067-70 (1990). 28. Rocchi, A. et al. CD99 inhibits neural differentiation of human Ewing sarcoma cells and thereby contributes to oncogenesis. J Clin Invest 120, 668-80 (2010). 29. Manara, M. C. et al. CD99 acts as an oncosuppressor in osteosarcoma. Mol Biol Cell 17, 1910-21 (2006). 30. Scotlandi, K. et al. CD99 isoforms dictate opposite functions in tumour malignancy and metastases by activating or repressing c-Src kinase activity. Oncogene 26, 6604-18 (2007). 32. Arjonen, A., Kaukonen, R. & Ivaska, J. Filopodia and adhesion in cancer cell motility. Cell Adh Migr 5, 421-30 (2011). 33. Asparuhova, M. B., Gelman, L. & Chiquet, M. Role of the actin cytoskeleton in tuning cellular responses to external mechanical stress. Scand J Med Sci Sports 19, 490-9 (2009). 34. Evelyn, C. R. et al. CCG-1423: a small-molecule inhibitor of RhoA transcriptional signaling. Mol Cancer Ther 6, 2249-60 (2007). 35. Medjkane, S., Perez-Sanchez, C., Gaggioli, C., Sahai, E. & Treisman, R. Myocardin-related transcription factors and SRF are required for cytoskeletal dynamics and experimental metastasis. Nat Cell Biol 11, 257-68 (2009). 36. Magnaghi-Jaulin, L., Masutani, H., Robin, P., Lipinski, M. & Harel-Bellan, A. SRE elements are binding sites for the fusion protein EWS-FLI-1. Nucleic Acids Res 24, 1052-8 (1996). 37. Watson, D. K. et al. FLI1 and EWS-FLI1 function as ternary complex factors and ELK1 and SAP1a function as ternary and quaternary complex factors on the Egr1 promoter serum response elements. Oncogene 14, 213-21 (1997). 38. Miralles, F., Posern, G., Zaromytidou, A. I. & Treisman, R. Actin dynamics control SRF activity by regulation of its coactivator MAL. Cell 113, 329-42 (2003). 39. Selvaraj, A. & Prywes, R. Expression profiling of serum inducible genes identifies a subset of SRF target genes that are MKL dependent. BMC Mol Biol 5, 13 (2004). 40. Kauer, M. et al. A molecular function map of Ewing's sarcoma. PLoS One 4, e5415 (2009). 41. Amsellem, V. et al. The actin cytoskeleton-associated protein zyxin acts as a tumor suppressor in Ewing tumor cells. Exp Cell Res 304, 443-56 (2005). 42. Delaroche, D. et al. Cell-penetrating peptides with intracellular actin-remodeling activity in malignant fibroblasts. J Biol Chem 285, 7712-21 (2010). 43. von Levetzow, C. et al. Modeling initiation of Ewing sarcoma in human neural crest cells. PLoS One 6, e19305 (2011). 44. Tirado, O. M. et al. Caveolin-1 (CAV1) is a target of EWS/FLI-1 and a key determinant of the oncogenic phenotype and tumorigenicity of Ewing's sarcoma cells. Cancer Res 66, 9937-47 (2006). 45. Cen, B. et al. Megakaryoblastic leukemia 1, a potent transcriptional coactivator for serum response factor (SRF), is required for serum induction of SRF target genes. Mol Cell Biol 23, 6597-608 (2003). 46. Jiang, X. et al. CD133 expression in chemo-resistant Ewing sarcoma cells. BMC Cancer 10, 116 (2010). 47. Evelyn, C. R. et al. Design, synthesis and prostate cancer cell-based studies of analogs of the Rho/MKL1 transcriptional pathway inhibitor, CCG-1423. Bioorg Med Chem Lett 20, 665-72 (2010). V9N5 ESUN Copyright © 2012 Liddy Shriver Sarcoma Initiative. October 15, 2012 - The Liddy Shriver Sarcoma Initiative is pleased to announce the awarding of a $250,000 research grant for an international collaborative study on bone sarcomas. The grant brings together researchers from Austria, Italy and the United States in a two-year study of these rare childhood cancers. Osteosarcoma and Ewing's sarcoma of the bone are aggressive cancers that tend to strike children and young adults. The major problem facing pediatric and young adult sarcoma patients is the ability of these tumors to spread (metastasize) and invade other organs. Metastasis is almost always associated with a poor prognosis, with an overall survival rate of just 10-20%. The investigators in this study aim to gain a better understanding of bone sarcoma metastasis in the hopes of stopping the spread of the disease. Dr. Elizabeth Lawlor explains: "Unfortunately, sarcomas can metastasize months or even years after the original tumor responds to therapy. The goals of this research study are to understand how bone sarcoma cells move from the site of the original tumor to other places in the body and to test novel drugs that may be able to block this process." Dr. David Loeb, who recruited the other investigators to the project, is motivated by his patients: "During the course of my career, I have seen the treatments for localized Ewing sarcoma improve markedly, and we are now curing many more patients than ever before; however, our ability to treat patients with metastatic disease is no better than it was when I was in medical school." Dr. Heinrich Kovar also wants to see research lead to more effective treatments for patients: "Twenty-four years ago, I started research into Ewing’s sarcoma. By coincidence, my brother was diagnosed with this rare disease only a few months later. He asked me many questions about the pathogenesis of his tumor and future treatment options that I could not answer. Today, we know a lot more, but not enough to translate our findings into more effective treatments." "This is a wonderful opportunity for laboratories across the world to pool their expertise to address problems in a comprehensive way. " The Liddy Shriver Sarcoma Initiative awards international collaborative grants like this one in order to increase the power of private donations and to accelerate research that has the potential to save and improve lives. In separate interviews, each member of the research team mentioned the slow and frustrating nature of science. Each also expressed the hope that collaboration might bring about real results for patients. Dr. Katia Scotlandi explained: "Our lives are too short for science. I mean that research is difficult and frequently frustrating, and only a few significant results can be achieved in a doctor's lifetime. Collaborating with other scientists is a means to speed up the process and possibly to increase the number of significant results that we see." Dr. Lawlor added, "Many aspects of the research will move faster because we can share our resources, intellectual and technical expertise. International collaborations are challenging, but with modern telecommunication tools and motivated investigators they can, and do, work. For rare tumors such as sarcomas, it is essential that research efforts cross traditional boundaries and borders." Because sarcomas are different than the majority of cancers in both children and adults, most cancer research funding does not result in advances for sarcoma patients. Dr. Loeb describes the problem, "Most adult tumors are carcinomas…they arise from completely different cell types, and the way they develop is quite distinct from the ways sarcomas develop. The most common childhood cancers are leukemias, and the concept of metastasis is meaningless in leukemia. Thus, sarcoma-specific research is critical to the advancement of treatment for children and young adults with sarcoma." Developing new treatments for sarcoma patients can be difficult for many reasons. Drugs for rare diseases aren't expected to earn much revenue for pharmaceutical companies, so investment in drug development is limited. When new drugs are developed, they must first be tested for many years before they become available to most patients. But the results of studies like this one may show that doctors can use existing drugs to target sarcomas. Dr. Scotlandi adds, "Finding new therapeutic indications for existing drugs may be an efficient approach, because the profiles of these drugs is well known, thus they can be rapidly translated into phase II or III clinical studies." David M. Loeb, MD, PhD - the Director of the Musculoskeletal Tumor Program at the Sidney Kimmel Comprehensive Cancer Center at Johns Hopkins University. In this project, Dr. Loeb's team will test new compounds using osteosarcoma and Ewing sarcoma mouse models. Elizabeth R. Lawlor, MD, PhD - an Associate Professor of Pediatrics and Pathology at the University of Michigan. In this project, Dr. Lawlor's team will study the role of Rho-MKL signaling in bone sarcoma metastasis and test novel compounds to block this signaling pathway. Katia Scotlandi, PhD - the Chief of the CRS Development of Biomolecular Therapies at the Orthopaedic Institute in Rizzoli, Bologna. In this project, Dr. Scotlandi's team will work to understand the functions of CD99 in osteosarcoma and Ewing sarcoma. Heinrich Kovar, PhD - a professor of molecular biology at the Medical University in Vienna, Austria. In this project, Dr. Kovar's team will investigate the downstream gene regulatory pathway of Rho signaling and how it is influenced by the central mutation that characterizes Ewing’s sarcoma. This $250,000 International Collaborative Grant was co-funded by the Reid R. Sacco Memorial Foundation and the Liddy Shriver Sarcoma Initiative, each of which provided $125,000 in support. One of the goals of the Reid R. Sacco Memorial Foundation is to support basic research that will help adolescents and young adults with cancer. Gene and Lorraine Sacco expressed enthusiastic support for the study, "We're both proud and grateful to be able assist in this particular grant that was so carefully and purposefully constructed; it aligns perfectly with our mission and it is something we certainly could not have constructed ourselves." "We're both proud and grateful to be able assist in this particular grant that was so carefully and purposefully constructed; it aligns perfectly with our mission and it is something we certainly could not have constructed ourselves." The Sacco's also explained their choice to partner with the Liddy Shriver Sarcoma Initiative, "What has drawn us to partner with the Initiative is the Shrivers' amazing capacity to assemble balanced teams of remarkable research talent within a robust grant framework founded on a commanding scientific understanding and on disciplined financial accountability." Private donors Arlo and Sue Ellison made a generous contribution in support of this work as well. The Ellisons said, "The Initiative has repeatedly been able to direct their research dollars to scientists who have shown meaningful progress in their understanding of the biology of sarcomas. It is our hope that the shared ideas and knowledge of the four investigators involved in the International Collaborative Grant will increase the likelihood of significant advances." Melanie Lio of Strike Out Sarcoma also supported this grant in the memory of her son, Michael Lio. She said, "We decided to partner with the Initiative at the recommendation of some of the specialists we got to know during Michael's illness. While we are adept at fundraising, we leave it to the experts to see that our fundraising dollars are put to the best possible use." As a truly collaborative effort, this grant was also made possible by generous donations from Steve and Meghan Langseder of the Jack Langseder ForeverSTRONG Foundation (in Memory of Jack Langseder) and Tracy Russo of Fishin’ For The Cure (in memory of Matthew Siegle). (Krook et al. MCR 2014).